I just love Fabulous Freebie Friday over at the Sassy Studio Designs Paper Craft Planet group! Lindsay generously posts a sassy freebie and it's only available for 24 hours. Make sure to stop over because you won't want to miss this one! This is a day I've been dreading and looking forward to. I dread it because the last movie in the Twilight series is being released today. I know it's not everyone's cup of tea but I really enjoyed reading them. I always love finding something that my girls and I can do together and reading a fun series is something we can do even though we don't live close. Today, hopefully, I'll get to go see the movie with some of my favorite girls, my nieces! 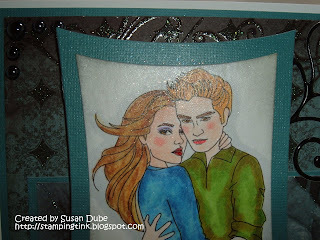 Breaking Dawn Part 2 I'm sure will be action packed and full of suspense, romance, and action. Oh and for me, Jacob! Yep, I'm team Jacob all the way! I so enjoyed reading the series with my daughters, just like I did all the Harry Potter books. Now, after the Hunger Games, my daughter Nichole has me started reading the Mortal Instrument books. I've got two so I'll be off on a new series. Aren't they gorgeous? I colored Edward and Bella with copics and Spectrum Noir markers and the papers are from the Immortal Love paper pack from DCWV. 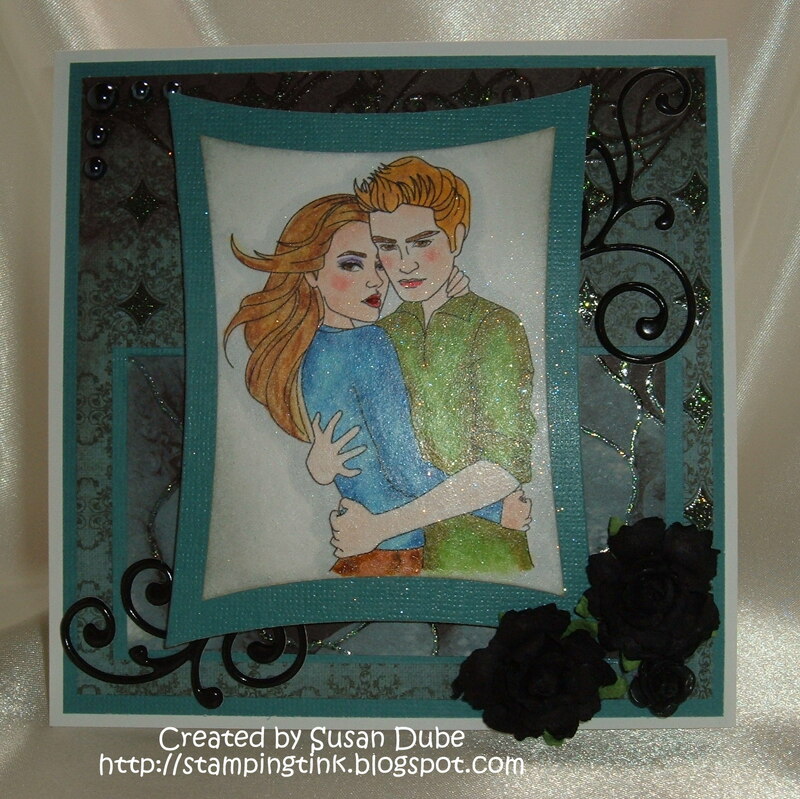 I used some Glitter Spray on the image and the background paper. The swirls are from Cloud 9 and the flowers from Recollections. The pearls are from my stash. I love the Wonky Rectangles dies from Spellbinders. They just seemed to fit this image to me. I also added some Black Soot Distressed Ink around the edges of the image and the inside. Here's a quick peek on the sides. 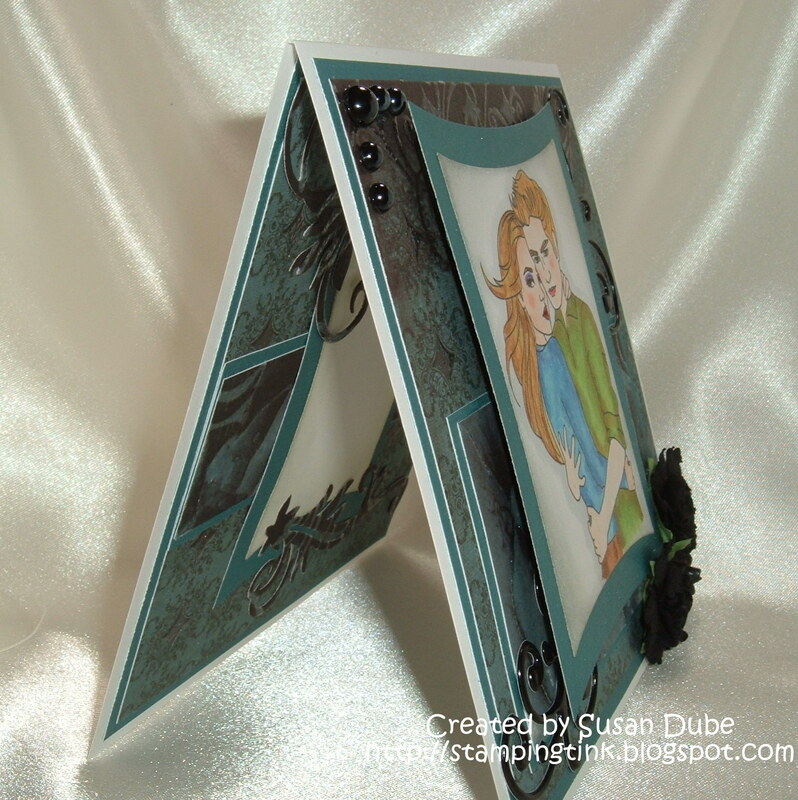 You can see the Spellbinder Floral Swirls I used for the inside. Here's a closer view of the happy couple. It was hard to get a really good picture of them with the Glitter Spray on them. Here's a good view of the inside. I love this paper and will be sad to put it away for a while. 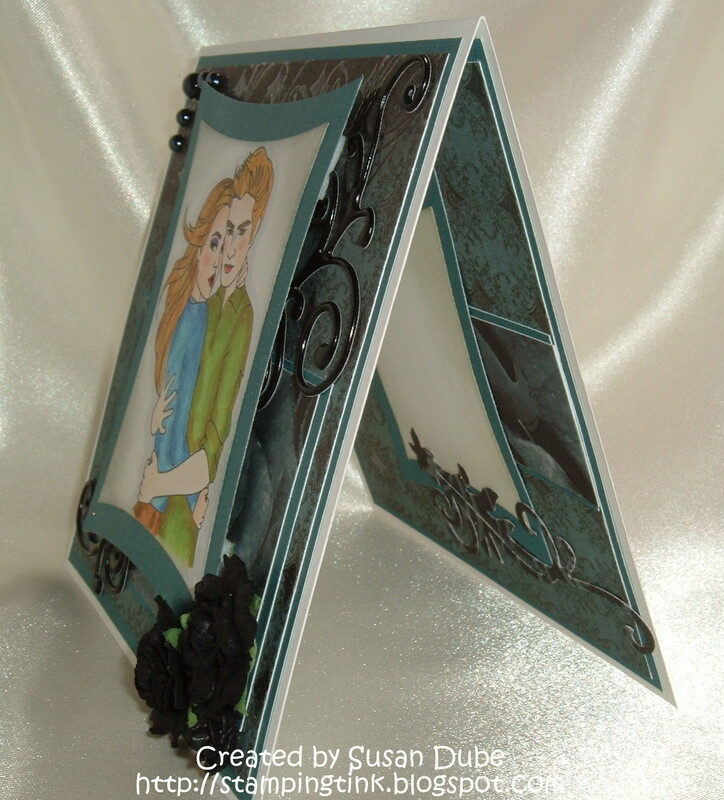 Make sure to stop by the Sassy Studio Designs blog tomorrow for our new release for Sassy Studio Designs called The Joy of Giving! I can't wait for you all to see these precious projects that my fellow Fabettes have in store for you! There some fabulous ideas for you to start off the holiday season right! Hope to see you there! Boy oh boy Susan!! You've created a gorgeous card!! Susan, you are truly queen of sparkle. I love that you used glitter spray and made the whole image just shine. 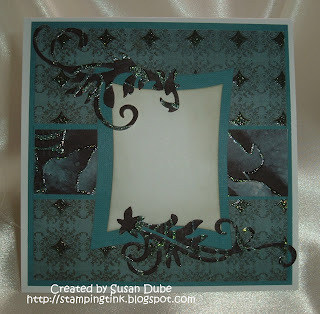 Love that patterned paper and black flourishes. Gorgeous!!!! Unbelieveable shading! I love the inside!!!! Very nice--my daughter and I went and saw the movie last night. So good, but so sad that it's over.